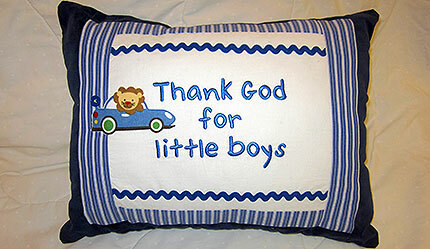 One of a kind pillows for boys. 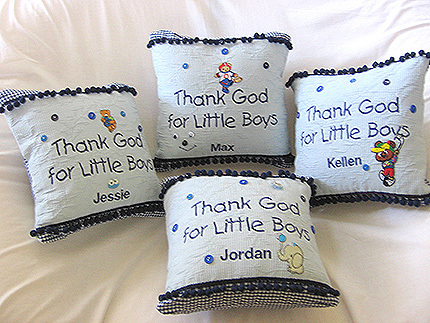 The Embroidered phrase on the front of each pillow is a reminder that everyone in heaven and on earth thinks that every little boy is very special indeed! Our pillows are enhanced with a variety of unique designs. We even added a handy little pocket on the back – a perfect place for the tooth fairy, prayer notes, pictures, etc. This is a pillow your son will cherish for years to come. 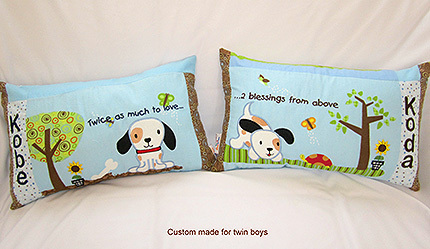 Every pillow is expertly handcrafted, and custom made to order. Check out our NEW TeachaBoo boy’s pillow! 1- We have the best motto in the world. 2– We have the cutest pillows in the world. 3– We have the one and only TeachaBoo Kids collection. And yes, they are the cutest little characters in the world! Our motto keeps us working hard for kids.